We love our annual traditions and enjoy adding new events as our congregation’s interests expand and our community establishes new ones. Our annual events, some newer, some very long-standing, are much-anticipated and beloved, not only by members of the church, but many of them by the entire community! Homecoming Day (September) – Held the Sunday after Labor Day weekend, this is day the new church year begins for Sunday School and when the church resumes its two-service Sunday schedule (9:00 a.m. and 10:30 a.m. when Sunday School is also available). 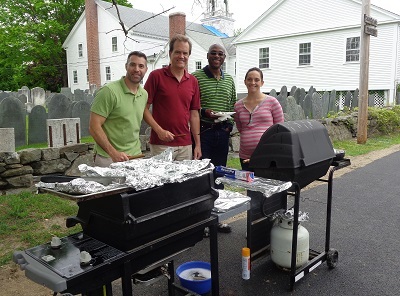 An all-church picnic is held after the 10:30 a.m. service, reuniting everyone after summer vacation and travel absences. Mission Trip Sunday (September or October) – Led by the youth and adults who participated in the summer Mission Trip, this is always a much-anticipated service. A slide show with lots of pictures of the trip, great music, and poignant sharing of experiences are why members of the congregation enjoy this service so much. 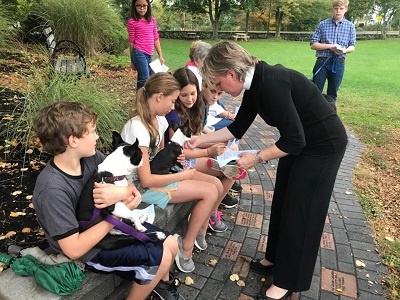 Blessing of the Animals (October) – Held at Little Nichols Field next to the church parking lot, we take the time to recognize the importance of animals in our lives and to bless them with God’s love and caring. 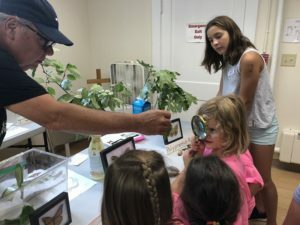 Feather Food Sunday (November) – Having received a “feather” a couple weeks before with a food annotated on the feather, on Feather Food Sunday, fresh fruits and vegetables are presented by the Sunday School children. These fresh fruits and vegetables are then used in the Thanksgiving Food boxes given by the church to local families in need. 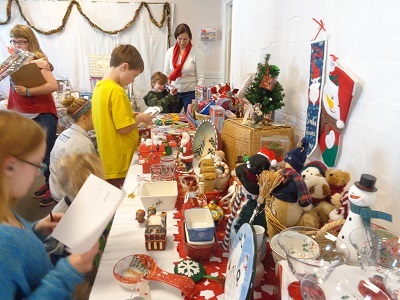 Christmas Fair (November) – A spectacular event for the entire community! If you like shopping for homemade arts, crafts, and foods, participating in a great basket raffle, eating a delicious lunch of numerous choices of hot soups, chowders, chilis, and other crockpot foods, listening to live Christmas music, pictures with Santa, an Angel Loft store for kids only (to buy gifts for their family without them seeing), making holiday crafts, an awesome gently used designer clothing and accessory shop, and much more, you will LOVE the church Christmas Fair! Town Christmas Concert Bake Sale (December) – Hosted by Women’s Fellowship, finger desserts sold with funds used to pay for the perishable food for the Christmas Food boxes distributed by the church to local families in need. 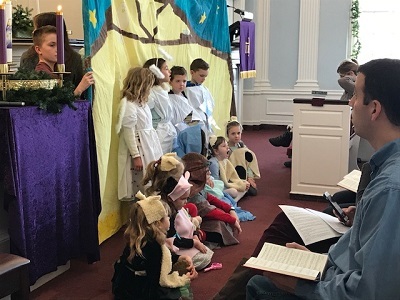 Christmas Tableau (December) – The Christmas Tableau is presented by the Sunday School children, telling the story of Jesus’ birth through music and scripture. It’s a fun but meaningful event that the children and congregation always enjoy! Advent Celebration (December) – Hosted by the Fellowship & Hospitality Committee, we welcome the joyful Christmas season by spending a bit of time with family and friends in fellowship and service. We share a light lunch, have some fun, create special gifts for others, and wrap up with traditional caroling. Music Concert (February) – Hosted by the Music Board and Women’s Fellowship, you will be truly amazed at the musical talent of members of our congregation! 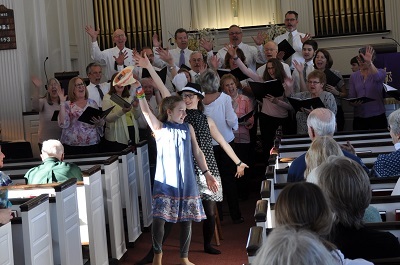 You will get to enjoy extremely talented youth pianists, violinists and vocalists, the music of our always-inspiring choir, spectacular bells choir performances, vocal/dance numbers, and often time special community guest performances. If you like music, you won’t want to miss this event open to the entire community and followed by refreshments. Mission Trip Spaghetti Supper (March) – A fundraiser for the summer mission trip, this has also become a fun and entertaining fellowship event, complete with music by many of our talented youth and adult congregation members, as well as a humorous maitre d’. 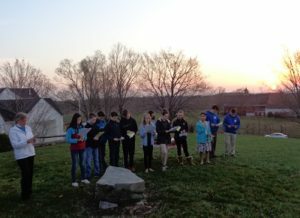 Easter Sunrise Service (March or April) – Held at the beautiful hillside of Triple Knoll Farm of Hollis at sunrise on Easter morning, the service is led by the confirmands (9th graders) each year. 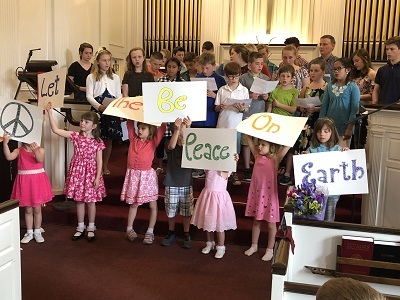 Children/Youth Sunday (May) – Held the Sunday before Memorial Day weekend, this service is led by the children and youth of the church on their last Sunday of the church school year. They perform all aspects of the service, including greeters, acolytes, scripture readers, receiving the offering, and performing dances, plays, and amazing music. It is their day to shine, and indeed they do each year! End-of-Year All Church Picnic (May) – Following the Children’s/Youth Sunday worship service, an all-church picnic is held after the 10:30 a.m. service, allowing everyone to gather for fellowship one last time before the summer service schedule starts and people start their summer vacation plans. In addition to some good food, outdoor fun activities are enjoyed, such as whiffle ball and playing on the playground at Little Nichols Field next to the church parking lot. Rocky Pond Service (June, Father’s Day Sunday) – A relatively new but already favorite annual tradition, we enjoy worshiping in the beauty of nature at Rocky Pond (usually just as the mountain laurel is in full bloom)! Mission Trip Work Camp (July) – Teens and adult volunteers spend a week in service at a regional community, helping families in need with house repairs and improvement. This annual week provides an interactive, reflective, relevant, fun and even transforming experience for participants who, in many cases, attend year-after-year. Vacation Bible School (July) – The most exciting four mornings of the summer! Children age 4 through grade 6, as well as adult and youth volunteers, have fun with music, crafts, outdoor games, drama, snacks and stories while learning and acting to help others. 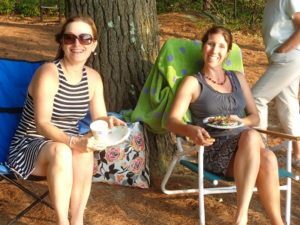 Rocky Pond Cookout (July) – A church favorite fellowship event! Adults and children alike enjoy the serenity of the Rocky Pond setting while having fun swimming in the pond, playing some outdoor games, eating some good cookout foods, and catching up with each other on what we’ve been up to over the summer so far. The Strawberry Festival (June) – This is town-favorite event where strawberries from our Hollis town farms, Lull Farm and Brookdale Farm, are used for strawberry shortcake, strawberry sundaes, or just bowls of strawberries while enjoying the music of the Hollis Town Band. 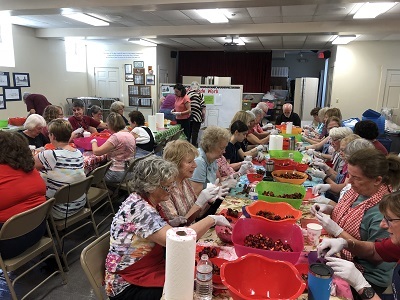 Strawberry hulling is done in church kitchen and fellowship facility on the Friday before festival. The church kitchen is used for staging and the strawberry food tent is located on the church lawn on day of festival. The Apple Festival (October) – The same as the strawberry festival in June, but with apples! 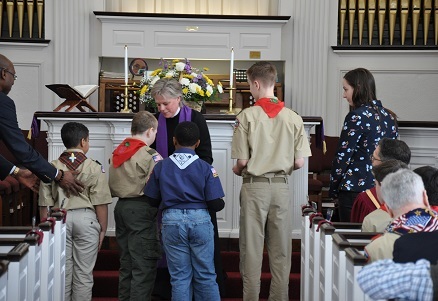 Scout Sunday (February or March) – Hollis Cub Scouts, Boy Scouts, and Girl Scouts participate in the church service as greeters, acolytes, reading of the scriptures, and receiving the offering. Spaghetti Supper (November) – Fundraiser for the Hollis Troop 12 Boy Scouts using the church kitchen and held in the Hardy Hall.